Eat your meals with flair in our decorative blue lacquered salad bowl set. 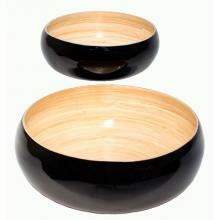 Crafted of eco-friendly natural bamboo, this bowl set is sure to impress all your guests. Eat your meals with flair in our decorative blue lacquered salad bowl set. 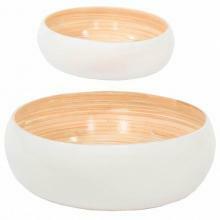 Crafted of eco-friendly natural bamboo, this bowl set is sure to impress all your guests. 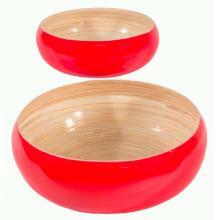 Place your salads and larger meals in the 12-inch diameter bowl. For fruit salads, appetizers and smaller meals, go with the 9-inch bowl. These teal-colored lacquered salad bowls will great on your table or shelf. To complete the experience, order the optional wood serving spoons. Handcrafted from eco-friendly natural bamboo.